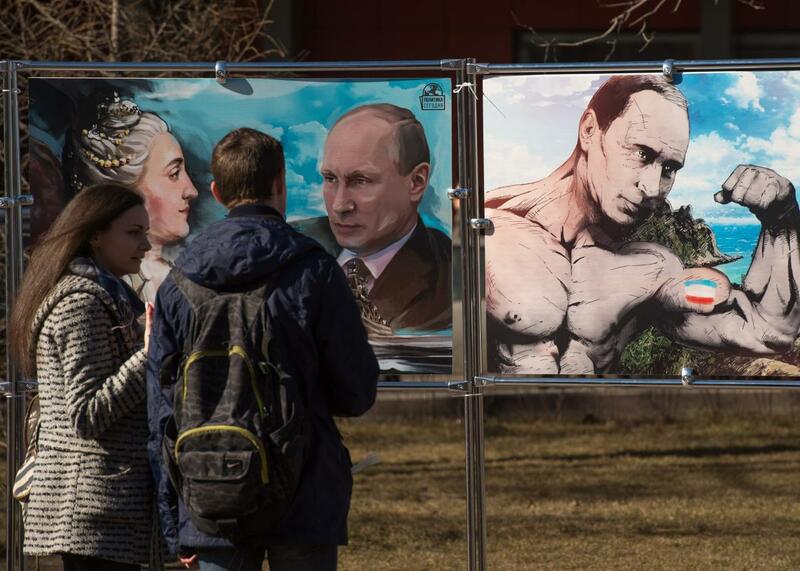 Is Putin really stronger than Obama? What does that even mean? He does have his fans. Remember the days when Republicans attacked President Obama for being too soft on Russia’s Vladimir Putin? Today, the line is that he’s not enough like Putin. This is a highly stupid conversation for a lot of reasons, but the main one is the assumption that people in all countries want the same things from their leaders and perceive their national interests in the same way. Putin may be the leader that Russians want, but that doesn’t mean he’s serving his nation well. Trump is right that Putin polls very well, even in polls conducted by the independent and frequently critical Levada Center, which as it happens, the government blacklisted as a “foreign agent” this week, something I assume the ratings-obsessed Trump fantasizes about being able to do. Most Russians get their news from state-affiliated television networks and voicing dissent is not the safest activity in the country, but we can still assume that a lot of the support for Putin is genuine and deeply felt. At his lowest point, Putin was polling at 61 percent, a number Barack Obama, not to mention Trump, would happily take. Remarkably, Russians are backing Putin in spite of the longest recession in two decades, caused by the drop in global oil prices decimating the country’s energy-dependent economy. Millions of Russians sank into poverty last year as wages stagnated, and consumers are cutting back on food and medicine because of inflation. Russians don’t even like their government that much (53 percent of them disapprove of it according to Levada’s numbers). They just really like Putin. And despite everything I just said, I don’t blame them, given what came before him. In the generation before Putin’s elevation to power, Russians saw an empire collapse along with an ideological system that millions had placed their faith in for decades. Instead of peace and prosperity, the transition to democracy and capitalism brought a decade marked by corruption, crime, terrorism and distress coupled with the enrichment of a small new class of politically-connected oligarchs. Given the options they’re now seriously considering, I shudder to think of the kind of politicians Americans would elect after something equivalent to the Yeltsin years. Whatever else he may be, Putin projects responsibility, sobriety (in multiple senses of the word) and a steady hand on the affairs of state. And he has, indeed, ensured that Russia remains relevant on the world stage, righting what most Russians perceived as a grievous historical wrong by retaking control of Crimea and re-establishing Russia as a critical player in the Middle East. A large majority of Russians believe that having a strong leader is more important than having democracy. They believe it is natural for Russia to have an empire, and that it is unfortunate that the Soviet Union no longer exists. Based on recent trends, we can assume that they’re also willing to trade domestic economic wellbeing for an active foreign policy that extends Russia’s geopolitical influence—something President Obama has often failed to understand in his dealings with Putin. Most Americans, however, would not be wiling to accept an economic situation akin to Russia’s in exchange for, say, a more effective strategy in Syria. And while this election has tested my faith, I don’t believe Americans are willing to sacrifice competitive elections or a critical media for a leader with some abstract quality of strength. Putin may be giving Russians the leadership they want, but suggesting that this tells us anything useful about how a U.S. president should govern isn’t just misguided, it’s un-American.